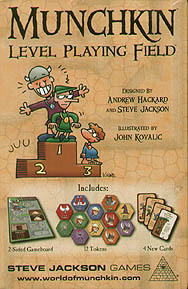 It's a gameboard for Munchkin - a dungeon room for every level, plus spaces for the decks and discards, so you can instantly see who to pick on who's ahead. Includes male/female tokens in six colours, and matching coloured markers with special in-game bonuses for each player, giving you more reasons to fight over trade cards! And you get four brand-new Munchkin cards!